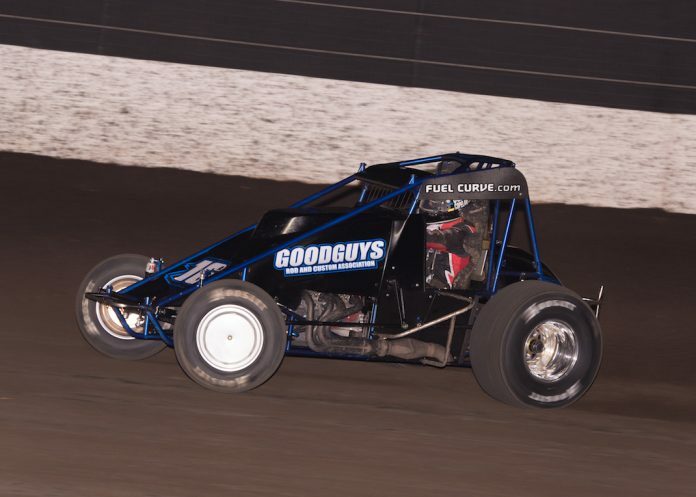 CALISTOGA, Calif. — Colby Copeland led all 30 laps to win the sprint car feature on Sunday’s finale of the Louie Vermeil Classic at Calistoga Speedway, but only after outrunning the AMSOIL USAC-CRA championship leader Broady Roa, who stalked him through lapped traffic in the closing laps. Roa, who started third, kept pace with Copeland the entire race and with five laps to go moved up to Copeland’s rear bumper but never found the opening he needed to challenge for the win. “I knew I had a shot if he tripped up and he did a couple of times in turn one and two,” said Roa, “but I tripped up, too. Chase Johnson, who started fourth and claimed the third spot in the opening laps, ran with the leaders for the entire race but backed off to save fuel and settled for the final spot on the podium. “I felt like we were stronger than where we finished but the car started to sputter over the last 10 laps, so I let the leaders get away,” said Johnson. “I didn’t want the same result as last night,” he added, in which he ran out of fuel with a handful of laps remaining. Roa’s finish on the podium strengthened his lead in the standings, but only after a season-long feud with his closest contender exploded in a controversy that found six-time champion Damien Gardner blacked-flagged into the pit area before a lap was scored. Officials black-flagged Gardner for aggressive behavior after he rammed the back of Roa’s car during a yellow flag parade lap in retaliation for his claim that Roa intentionally rammed and spun him the lap before. Race officials had to red flag the race both to save fuel and to get an angry Gardner off the track. Shane Golobic won the midget feature. 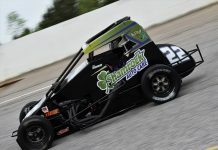 Colby Copeland, Brody Roa, Chase Johnson, Austin Williams, Ryan Bernal, Danny Faria Jr., Geoff Ensign, Austin Liggett, Cody Williams, Jace Vander Weerd, Max Adams, R.J. Johnson, Logan Williams, Chris Gansen, Zack Lynskey, Matt McCarthy, Shayna Sylvia, Cody Jessop, Nick Larson, Austin Ervine, Jake Swanson, Richard Brace Jr., Damion Gardner.